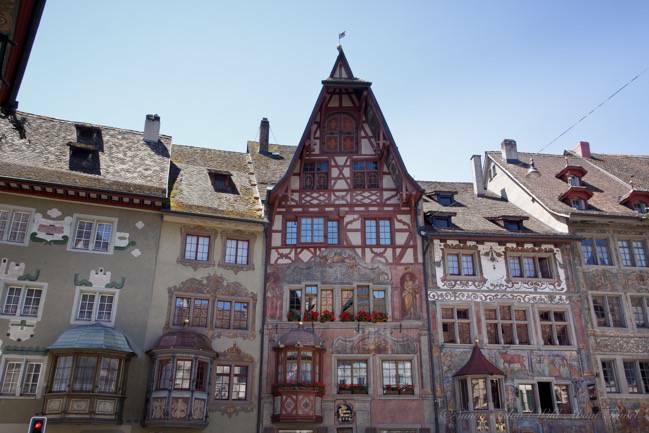 23 Jul Is Stein am Rhein One of the Most Charming Towns in Switzerland? 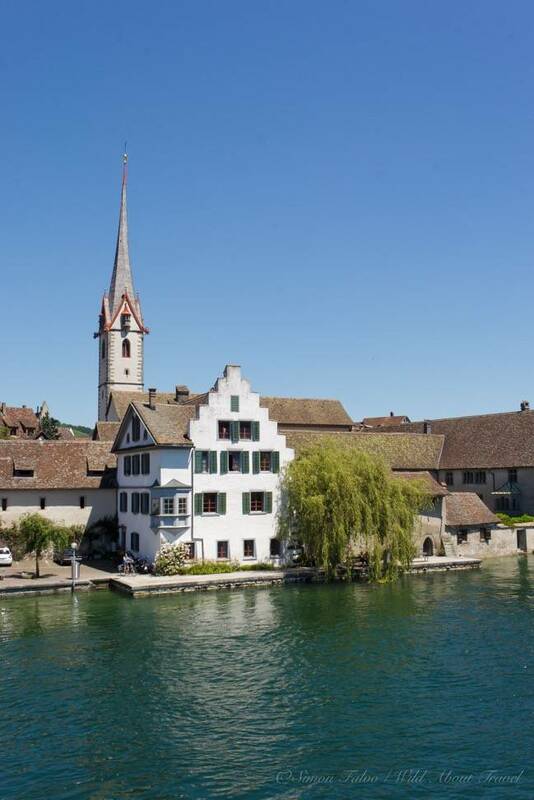 As soon as I caught sight of the river, bordered by pretty houses reflecting in the water, I knew that discovering Stein am Rhein was an excellent choice for a day trip from Zurich. 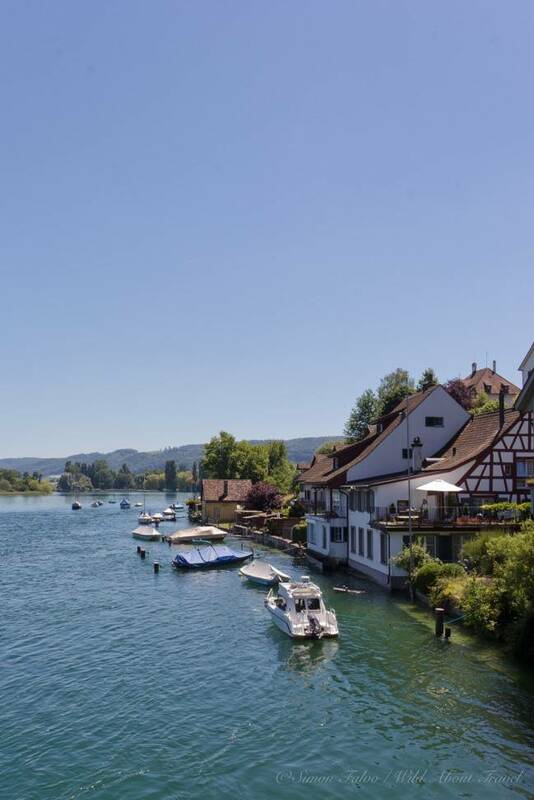 Originally a small fishing village built where the lower end of Lake Constance becomes again the river Rhine, Stein am Rhein developed in the 11th Century when Emperor Henry the II transferred the Benedictine St. George’s Abbey to the hamlet because of its strategic location. Emperor Henry II granted the Abbey ample rights, the trade developed at a good pace and the town became a prosperous commercial center. Looking at the beautifully painted façades and admiring the tastefully decorated protruding windows, it’s easy to see the wealth, culture and refined taste that developed in what once was only a tiny hamlet. 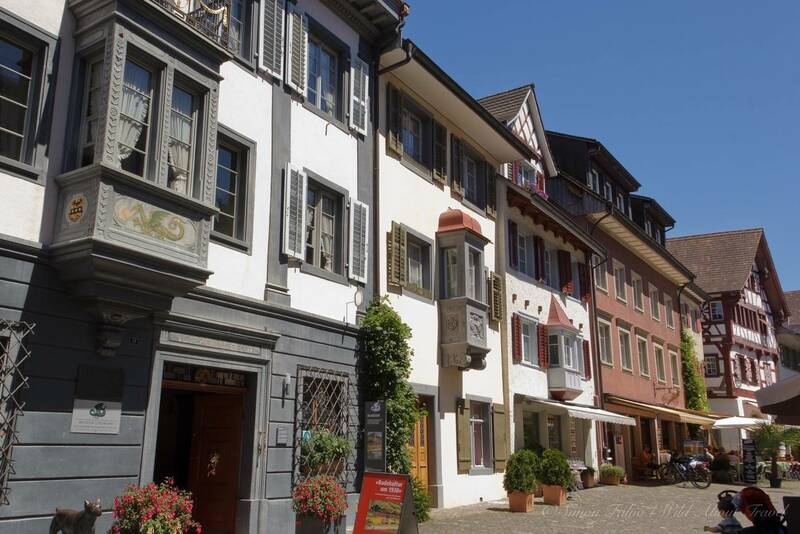 Stein am Rhein: one of the best preserved medieval towns in Europe. 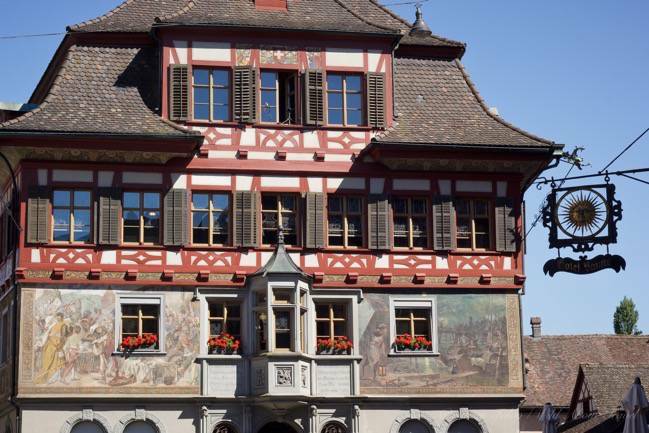 With little more than 3,000 inhabitants, Stein am Rhein may well be a small village but it is remarkable for the concentration of well preserved medieval buildings within such a compact area. 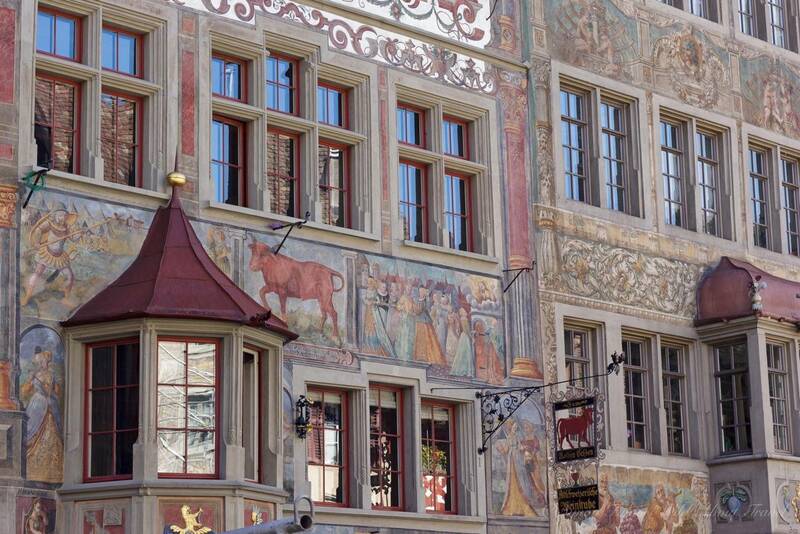 The jewel in the crown is the Rathausplatz – the square of the City Hall – whose entire perimeter is lined by old houses with magnificent painted façades. 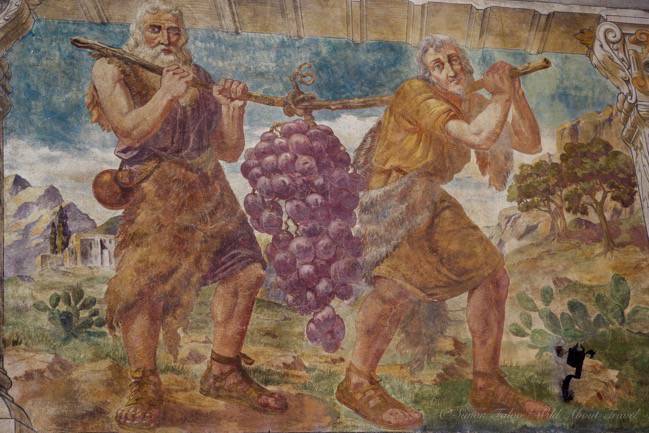 Every house has a different architectural structure, the subjects and colors of the murals vary, but the harmony is such that it is close to perfection. Unfortunately, when I visited part of the square was being set up with bleachers for an event, and part of the view was hidden. Notwithstanding, I was spellbound. 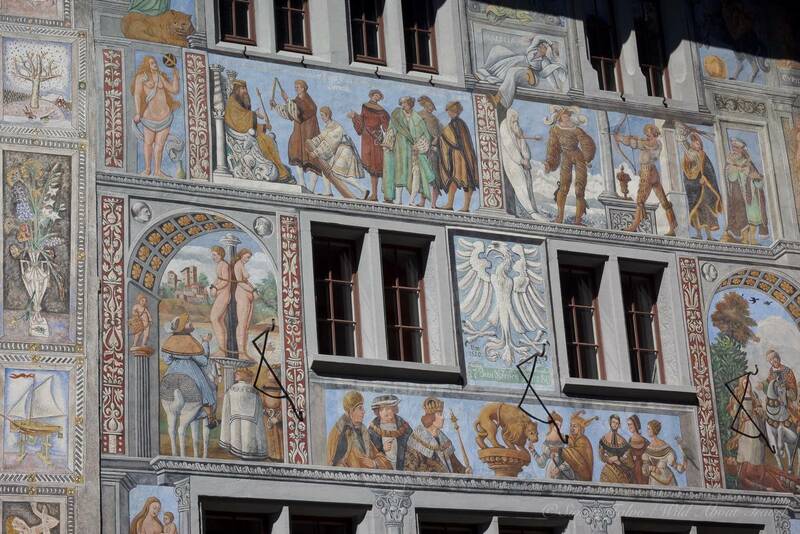 I loved the painted facades in Lucerne and was not expecting the ones in Stein am Rhein to be even more beautiful. Most of all, I was stunned by the elegance of the drawings, the tasteful combination of colors, and the perfect proportions between the architectural elements. Being hopelessly curious I would have liked to know more about the architecture and the stories told by the frescoes. When I travel I am first driven by instinct, but then I like to understand the frame and the background of what I’m admiring. That’s where it got difficult because I could find very little information online, and what little was mostly in German. There are, indeed, guided tours of Stein am Rhein, but besides being rather expensive, it’s not even clear if any of them is in English. That is not only a pity overall, but in a country like Switzerland, with 4 official languages (German, French, Italian and Romansh), I would have expected more care for non-German speakers. 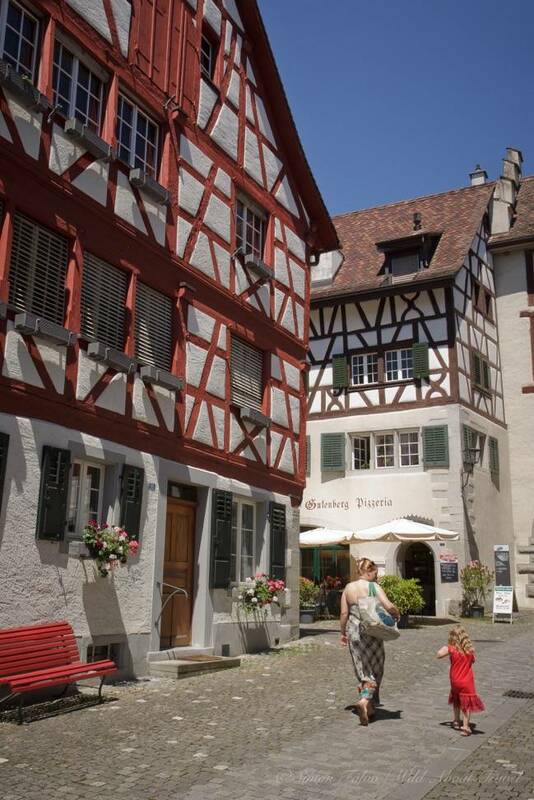 There are many lovely towns in Switzerland, but Stein am Rhein might well be one of the most charming. 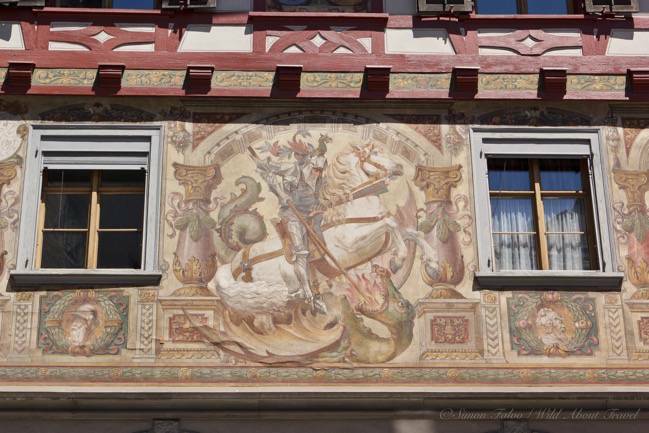 The beauty of Stein am Rhein doesn’t end in the Rathausplatz, though, and there’s more to see in the meandering alleys. 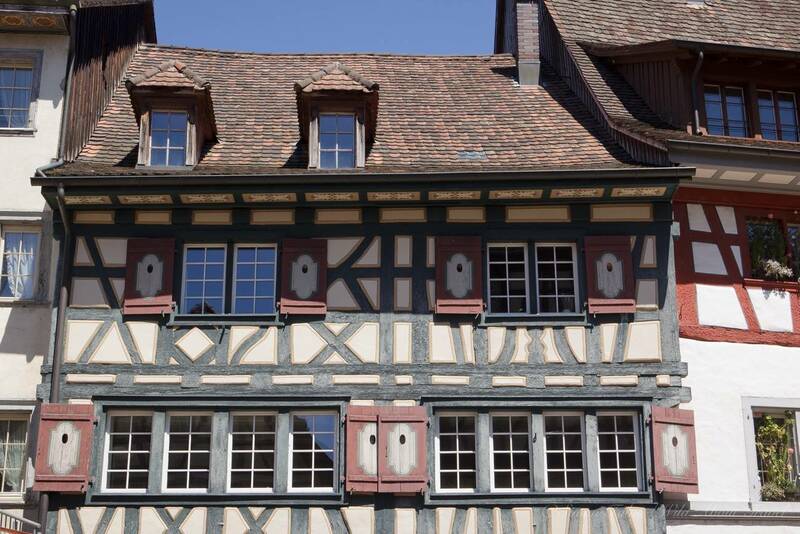 Here, the grandiosity is replaced by prettiness: facades with timber decoration, inviting al fresco cafés and restaurants, the arches that once were the entrance to the town. And there’s the Hohenklingen castle, perched on a hill partially covered with vineyards and protectively overlooking the town and the river Rhine. Here, the grandiosity is replaced by prettiness. Facades with timber decorations, inviting al fresco cafés and restaurants, the arches that once were the entrance to the town. And there’s the Hohenklingen castle, perched on a hill partially covered with vineyards and protectively overlooking the town and the river Rhine. The charm of Stein am Rhein is also in its location, and I ended up my day with a walk along the riverbank, listening to the soothing murmur of the water, watching the ducks and the swans gracefully gliding on the water. Time to leave this beautiful storybook village and to board on the boat that will drive me back to Schaffhausen. 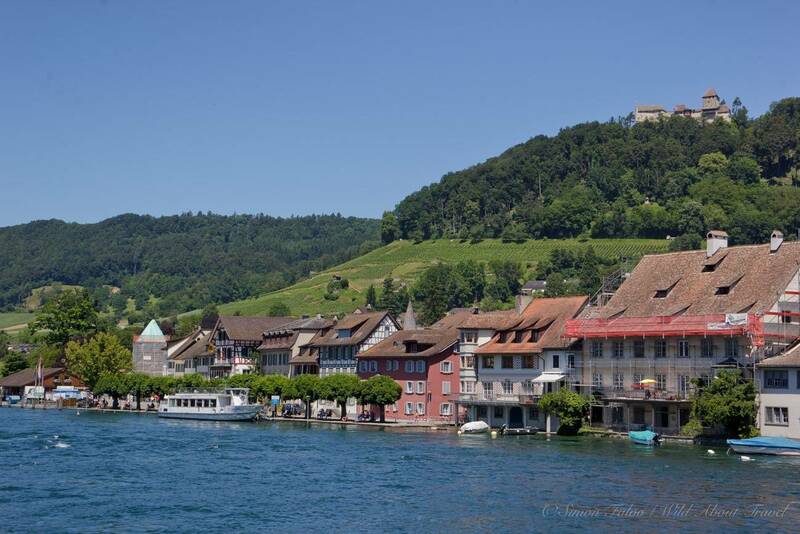 Whether you’re traveling in south Germany or north eastern Switzerland, don’t miss to visit Stein am Rhein. 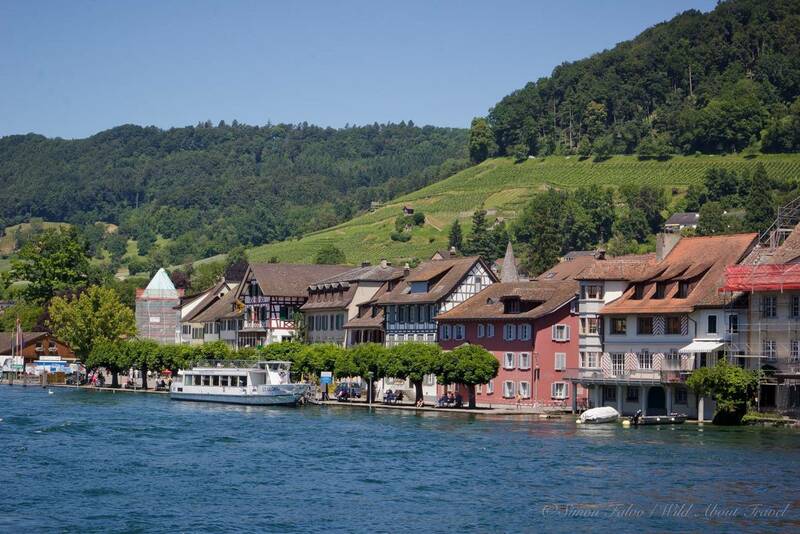 By car, it takes less than an hour to reach Stein am Rhein from Zurich (55 km), while the train ride takes 1h20min – 1h30min. 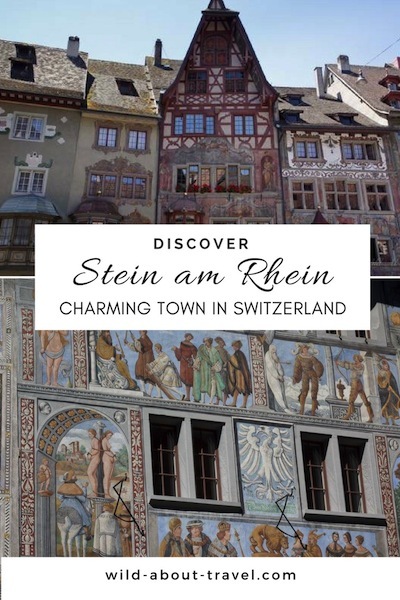 True that you can visit Stein am Rhein as a day trip from Zurich, but the town is so pretty and romantic that you may want to spend a night. 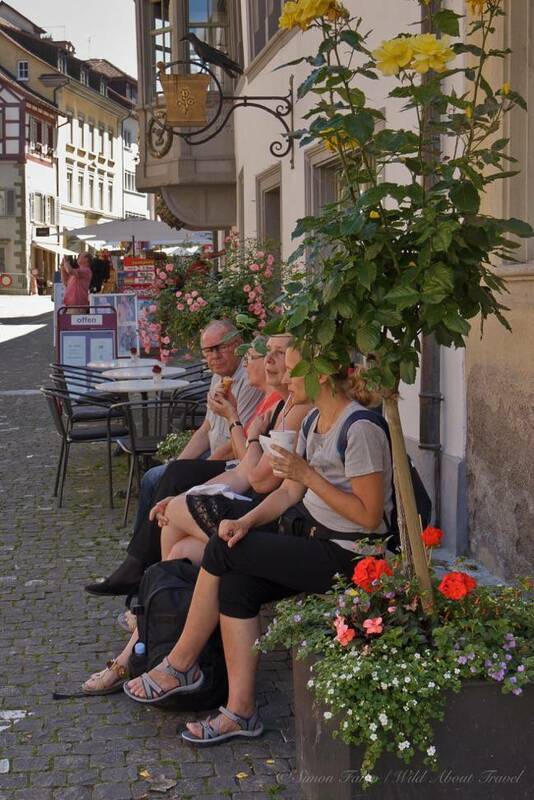 Hotel Adler: Simple and spotless, Hotel Adler is right in the heart of Stein am Rhein and from there you can walk everywhere. Hotel Chlosterhof Stein am Rhein: The modern building might not be the most attractive, but the hotel has charming views of the river and offers a wide array of amenities. Esprit du Monde: If apartments are your thing and you like small places with a special character, you can’t miss Esprit du Monde. The apartments are very tastefully decorated, and the sitting area in the garden is lovely. Disclosure: This article contains affiliate links. Should you make a purchase, the price is unchanged for you and it will make earn a few pennies to get the website running. Thank you. 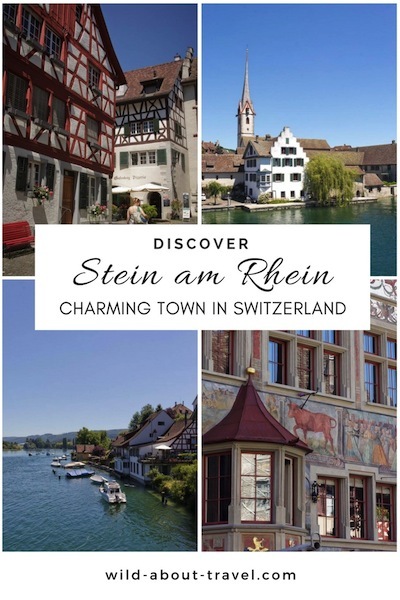 By seeing these beautiful pictures and after reading your blog I definitely feel that Stein am Rhein is one of the most charming towns in Switzerland. Now I am surely going to plan my vacation to these beautiful places in Switzerland.